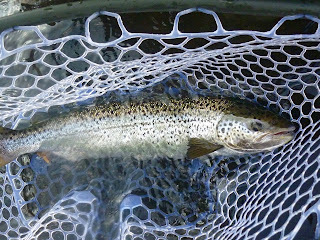 Atlantic Salmon Flies: Naugatuck Report - November 17 & 18, 2016 - The Last Warm Days of the Season? Naugatuck Report - November 17 & 18, 2016 - The Last Warm Days of the Season? I was pretty giddy about the 17th. It was two days after a good rain. The river would be clear and dropping. Temps were expected to reach 60º. I had a guide trip that day and I was very optimistic. I didn't pack enough clothes. It was windy and never felt as warm as it was supposed to. The fish took forever to wake up, not until around 2:00pm. Wayne landed the fish pictured above and pricked another, both on a sz. 4 Cascade. Fish were somewhat active in the afternoon. I thought we might have a red letter day, but it didn't go that way. Still, catching and releasing one salmon per day is pretty much ok with everyone, myself included. It was a fun time, despite feeling cold all day long. While we were fishing, Wayne and I saw a good sized salmon jump close to shore. We covered the fish, but it wanted nothing to do with us. As the sun began to fade, I began to think about the next day. It was supposed to be even warmer, which shouldn't be hard to achieve given how cold I felt all day on the 17th. I was debating whether or not to fish for 90 minutes while my son was at nursery school. It's a big gamble. I could use the time at home, alone. I thought out loud, to Wayne, "I'll tell you what's going to happen. I'm going to go to bed early tonight, then wake up around 3am to pee. Then, I'll debate whether or not to check the streamflow level on my phone. I won't be able to resist, so I'll check it. Then, I'll think about fishing and I won't be able to fall back asleep. Gah...maybe I should just stay home and watch a movie." Wayne said, "Send me an email and let me know how you make out tomorrow morning." I woke up at 2:52am and went to the bathroom. I debated looking at my phone for about 10 seconds before I realized my prediction sort of forced it to be my destiny. The flow was about 120 cfs. I was still sleepy, so I might be wrong. As predicted, I lied awake, thinking about how far the river would drop by my 10:00 ETA. 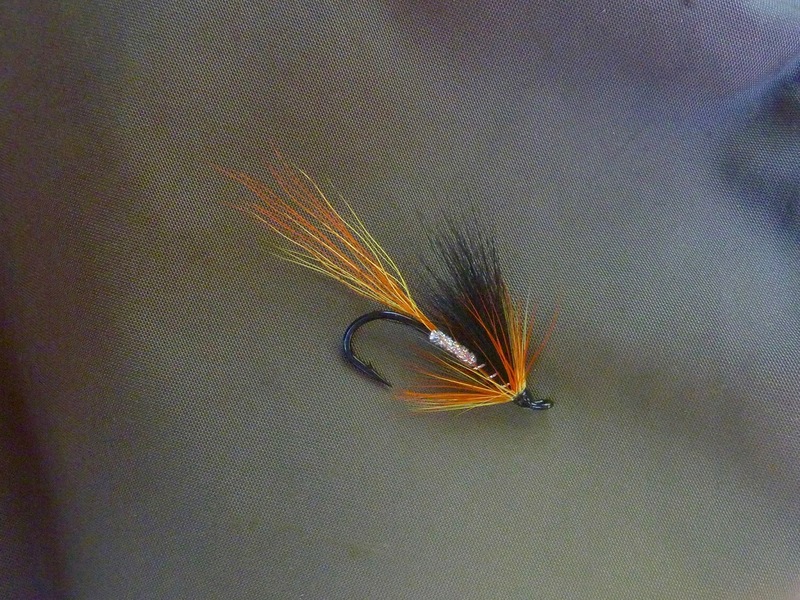 Cascades have been working well, but all I had left were big ones tied on tubes. I considered tying one at 3:30am, but I tried to fall back asleep instead. It took a while, but I got a couple more hours of shut eye. Around 7:30, I gave in to my son's demands to watch some dumb show on Netflix. I gave him something to eat and I slipped away to tie my #8 Cascade. 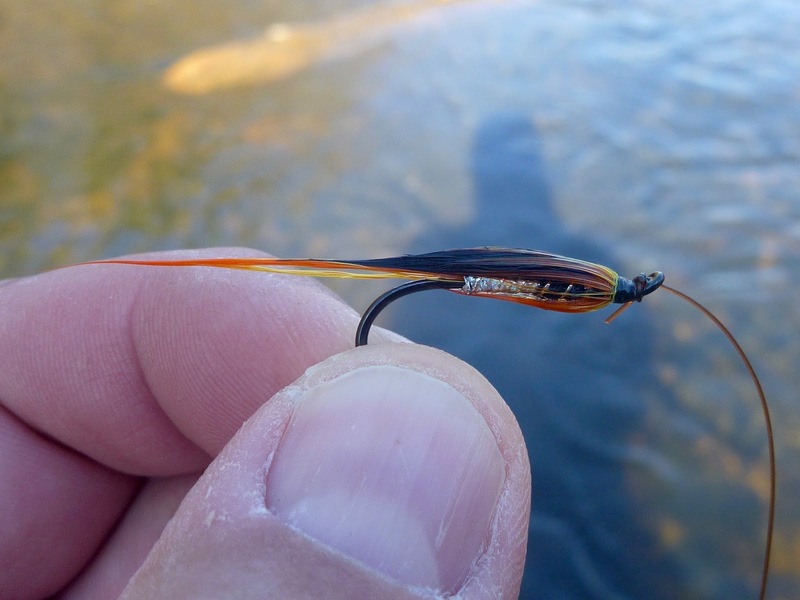 I knew this fly would be the one so long as I didn't forget in the vise. I put on one coat of Cellire and let the fly sit. Around 8:30, before the Cellire was totally hard, I added a coat of Sally Hansen's, then brought the fly down to the car. After school drop off, I was suited up and casting by 10:00am, just as planned. The sun was out and the wind was gone. I was sure I was going to hookup and hookup quickly. Everything felt right. I threw about six casts before my hunch was confirmed. A nice salmon grabbed my swinging Cascade and it was game on. By 10:07, the fish was landed. Mission accomplished. 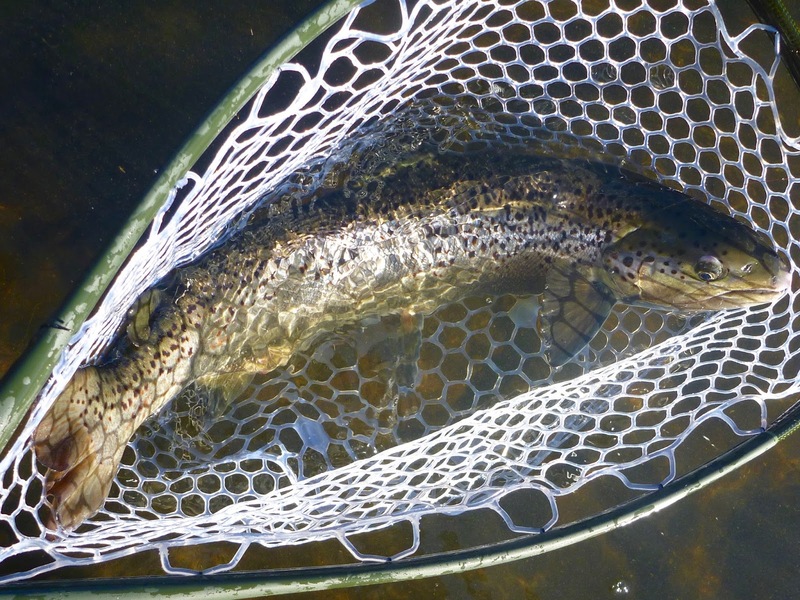 This fish was about 28" and just barely fit in the net. That was the only salmon I could nail in my 90 minute window, but I was definitely happy. I also caught a brown trout which I regret not netting. It was about 14" long and the most perfect looking trout I've seen come out of the Naugatuck River. The fins were perfect and all erect. The color was perfect. It was fat and in great shape. Was it a wild fish? It sure looked like one to me. It was the icing on the cake. I've been told there are wild browns in that river. Nice... gotta wonder if that brown was a resident or maybe one who has seen some time in the lower Hoosi? Yeah, no clue. I've caught some little ones I suspected to be wild before. I've caught bigger browns than this one before, but none so clean. It could have dropped down from one of the tribs.